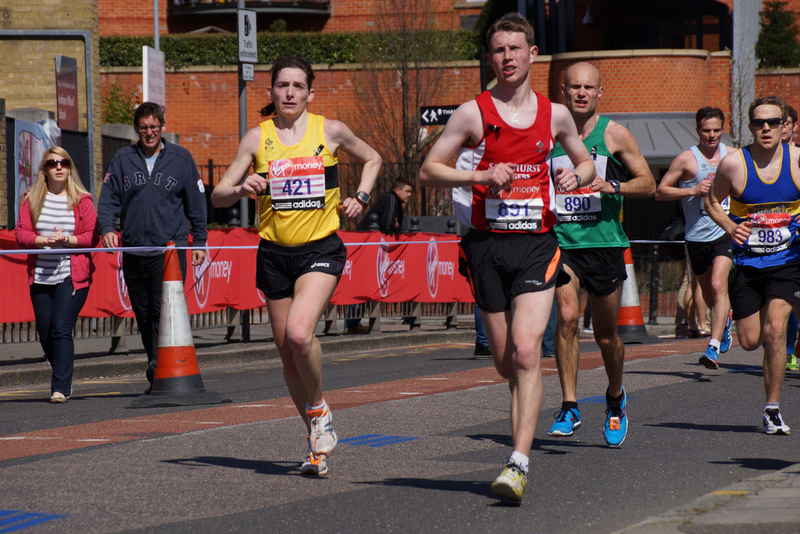 »Race Reports»Tracy Robinson doubled down on this year’s London Marathon and despite the temperatures knocked 29 minutes off her PB! Tracy Robinson doubled down on this year’s London Marathon and despite the temperatures knocked 29 minutes off her PB! I only wanted to run one marathon just to say I’d done it… that was last year. I found myself entering the ballot again but wasn’t successful so I decided to apply for a charity place. I was lucky enough to secure a place with the Lily Foundation and so began the training. I hadn’t run with the club for a while so most of my training runs were either solo or with a friend. My training had gone well, putting in quicker training runs than last year so I was confident I’d be able to beat my previous time. Then the weather changed… like most I hate running in the heat. There goes all my hard work then! I went to the Expo on Wednesday and whilst there bought a hat. I went for a short run afterwards, in the heat, wearing my hat and knew I was in for a hot and difficult run on Sunday and was a bit gutted. I drank plenty of water in the few days before the run, so felt as prepared as I could be. I went up on the SJ bus and had a nice chat with Liz. We both realised we were guilty of not running much with the club this year (something that is going to change!). Myself, Liz and Debra picked our spot and took in the atmosphere while eating breakfast and queuing for the loos. I tried eating my porridge with a coffee stirrer as forgot my spoon but that didn’t work. I drank it instead!! had been debating what time to aim for considering the warnings to slow down because of the heat, so I changed my ambitious 4hrs to 4hrs 10. I was in starting pen 5 which had the 4hr pacers there. I started just before 10.30 and quite quickly the 4hr pacers were in front but still in sight. A friend had tried to break the race down for me… the 1st 6 Miles are just a warm up, the next 10 I could do for breakfast, the next 5 I could do in my sleep and the last 5 is just a sightseeing tour! And yes he has run it himself!! I took water at pretty much every stop I could and ran through most of the showers too. Although hot, I felt surprisingly ok. I got to halfway in 2hrs 1 min and decided to back off a bit. I’m not sure I could have kept it going the whole way and with numerous people walking very early on and people needing medical help, I thought it best to stick to my plan. The crowds and music were amazing and certainly helped spur me on. At mile 16 my phone died, so the thought that I had water damaged a second phone occupied my thoughts for a while! My quads also started to hurt at this point too, but I just needed to keep going. I threw so much water over myself I could actually wring my top out! Mile 23 came and a friend I wasn’t expecting to see gave me a massive shout! I was so happy!! I knew I could do this then, just 3 miles to go, just a run to the meadows and back. The little demons tried to enter my head telling me to have a little walk but no way was I listening to them! I rounded the corner and saw the 385 yards sign and the finish. A quick check of the watch told me I could scrape in under the next minute so I sped up for a fast (not quite sprint!) finish. I saw Jane Bannister and Richard Boese and then got given my medal by Carolyn. My fault no one really recognised me as hadn’t been for a while! Chris Lambourn gave me a well done hug and off to horse guards parade I went! My phone thankfully only had a flat battery so as soon I had it charged I could see my time was 4hrs 7mins 53 secs, a PB by 29 minutes! Given the worry about the conditions, I didn’t find the race too bad! My hat stayed on too and was the best thing I could have bought! Jim Laidlaw was incognito at Waterloo in a cap and normal clothes, and asked how I’d got on. Sorry I looked surprised Jim!